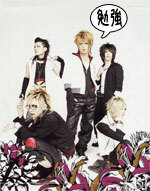 This visual kei band was formed in 2007 and made their indie debut the very next year. They have also developed popularity in parts of Europe by touring in France and Finland. They are currently on the Indie label delfisound.